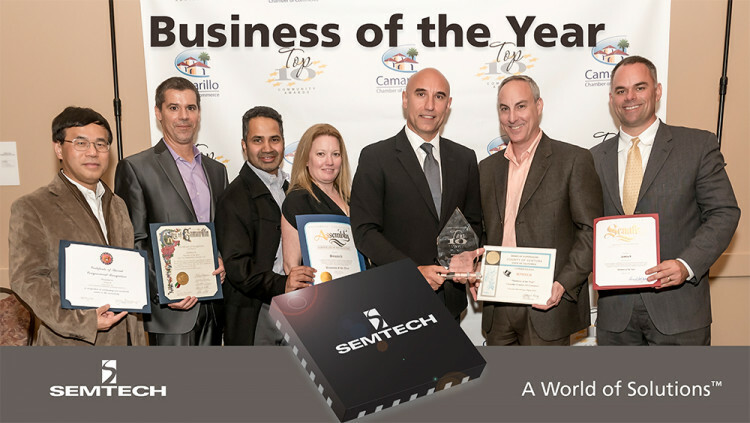 Semtech Corporation (Nasdaq: SMTC), a leading supplier of analog and mixed-signal semiconductors, was the recipient of Business of the Year at the 49th annual City of Camarillo Community Awards for its outstanding contributions to the community through its conservation, medical, community and charitable initiatives. Camarillo, which has been home to Semtech’s corporate headquarters since 2002, honors the community’s top citizens, businesses, entrepreneurs, educators and more at an annual award ceremony, which was held this year at the Serra Center in Camarillo. Semtech is actively involved in the surrounding community through its projects with the Fox Canyon Ground Water District, Dignity Health’s St. John’s Regional Medical Center, Startup Weekend Ventura County, and its bi-annual charity golf tournament benefitting local non-profits. At its last golf tournament held in June 2015, Semtech raised $42,000 for CASA of Ventura Country, Interface and Cancer Hope Foundation. Using its award-winning LoRa™ wireless RF technology that enables connected Internet of Things (IoT) applications, Semtech and several partner companies presented a proposal to automatically track groundwater pumping data from the Fox Canyon Aquifer. This streamlined process is expected to both reduce costs associated with manual data tracking and make groundwater conservation processes more efficient. In addition, Semtech’s LoRa team will use a network of LoRa sensors at Dignity Health’s St. John’s Hospital to monitor patients’ beds to prevent injury from falling. Semtech is the technology sponsor of Startup Weekend Ventura County on March 11-13 at Rancho Campana High School in Camarillo. Participants will use Semtech LoRa technology to develop innovative IoT solutions to problems or needs in the healthcare or agriculture industries during the 54-hour event. “Semtech is a proud member of the Camarillo community, and we are dedicated to using our technological strengths and strong community ties through our employees to benefit local agriculture, hospitals and non-profit organizations. It’s an honor to receive recognition from our peers at the Camarillo Chamber of Commerce,” said Alberto Guerra, Senior Vice President and Chief Marketing Officer of Semtech, who was on-hand to accept the award. Semtech received several certificates of recognition from the state and federal legislatures acknowledging its award. All statements contained herein that are not statements of historical fact, including statements that use the words “enables,” “expected to” or other similar words or expressions, that describe Semtech Corporation’s or its management’s future plans, objectives or goals are “forward-looking statements” and are made pursuant to the Safe-Harbor provisions of the Private Securities Litigation Reform Act of 1995, as amended. Such forward-looking statements involve known and unknown risks, uncertainties and other factors that could cause the actual results of Semtech Corporation to be materially different from the historical results and/or from any future results or outcomes expressed or implied by such forward-looking statements. Such factors are further addressed in Semtech Corporation’s annual and quarterly reports, and in other documents or reports, filed with the Securities and Exchange Commission (www.sec.gov) including, without limitation, information under the captions “Management's Discussion and Analysis of Financial Condition and Results of Operations” and “Risk Factors”. Semtech Corporation assumes no obligation to update any forward-looking statements in order to reflect events or circumstances that may arise after the date of this release, except as required by law.